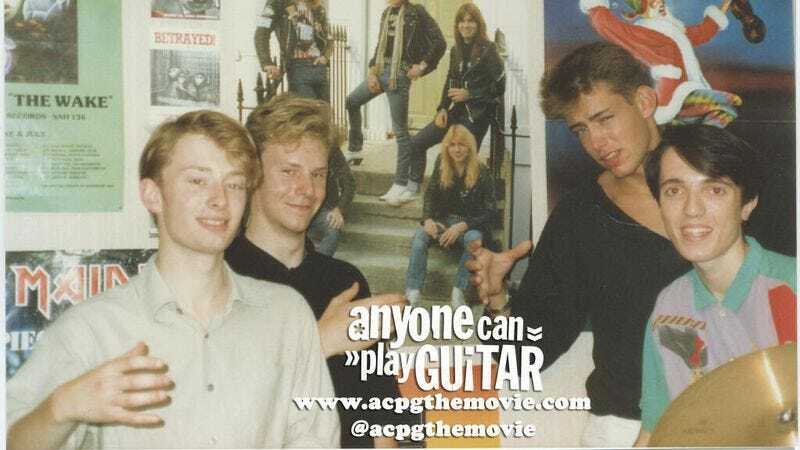 It’s weird to think about, but Radiohead has been together as a band in one form or another for almost 30 years. Back in the mid-‘80s, the group—sans Jonny Greenwood—came together as On A Friday, a group that somehow managed to feature not one, not two, but three saxophone players. Thankfully, a fellow scene player captured the Iron Maiden-loving band on film, and that picture has emerged in support of a new documentary about the Oxford, England music scene. The trailer for that movie, Anyone Can Play Guitar, is below, along with the gawky, awkward photo that just has to be seen to be believed. Phil had hair! Anyone Can Play Guitar Trailer from video jon on Vimeo.